Success – Anyone can achieve their goals.. yes…including you! Real World Success – Spectacular results come from doing the very simple process of eating the right foods in the right amounts to the backdrop of exercise day in day out for a few months in a row. Unspectacular but effective. No secrets..just consistency. Feeling Good – Getting in shape allows you to feel you’re at your very best. It gives you access to feelings that cannot be achieved elsewhere. It is the simplest and most reliable way to consistently feel good about yourself and thus feel happy. Your Goals – I work off the basis that you want to look good and feel happy while living a fulfilling life. My approach works on these areas. Belief – You do not need to believe you will be successful to succeed. You must simply be prepared to do the necessary behaviours that bring about success. If you do A, B and C just as the body asks you will get the results your desire. This will happen whether you believe it will or not. Belief & Behaviour – It is only important to believe you will succeed if the premise of you doing the necessary behaviours is that you believe they will be successful. The irony of people in amazing shape is they would do most of the same behaviours whatever the result of doing them was. This is the process of automating your results. I would ask you to trust the process. I have seen so many people get results who did not believe it was possible. Just do what is needed and let the body show you what it thinks. 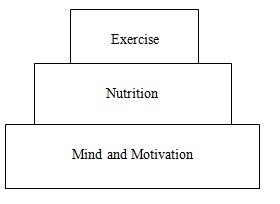 Results – To achieve your results you must combine motivation with nutrition topped off with exercise. Fat loss – To lose fat (weight) you need to create a minor calorie deficit through a combination of managing food intake, moving your body and developing your underlying metabolic rate and physiology. This latter point relates to improving your health through maximising nutrient intake and minimising stress and toxins. Calories – Fat loss is NOT the simple game of maths with calories in minus calories out. Due to hormones the body’s calories used and the effect of calories consumed will be different. This gives rise to heavy and light calories and other factors to consider. Calories – While the pure simplest calorie model is outdated the general concept still applies. If you are eating too much you will not lose fat. The problem these days though is most people eat way too little when being “healthy” and then way too much when being “bad” This annoys the body on both fronts.